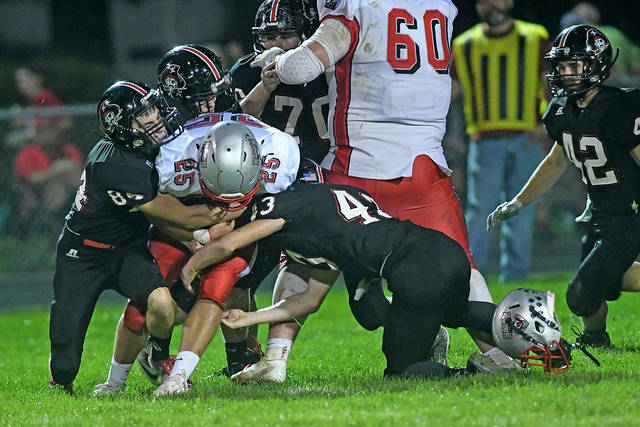 Ben Robinson/GoBuccs.com Brayden Wiggins (20) and Gavin McReynolds (64) make a tackle for a safety against Tri-County North Friday night. Ben Robinson/GoBuccs.com The Covington defense swarms to the ball. Ben Robinson/GoBuccs.com Covington’s Parker Dysinger celebrates a sack Friday night. COVINGTON — Confidence in high school athletics is critical to success, but when a team is coming off of three straight defeats to quality opponents the psyche of those in uniform can become fragile. Which is why the 45-8 shellacking the Covington Buccaneers handed Tri-County North on Friday was a huge confidence boost for a relatively young team still in search of an identity. And it was the Buccaneer defense that set the tone by recording a safety early in the opening quarter for the first points of the game. This came after Covington took the ball deep into Tri-County North territory, but turned the ball over on downs inside the Panther ten. 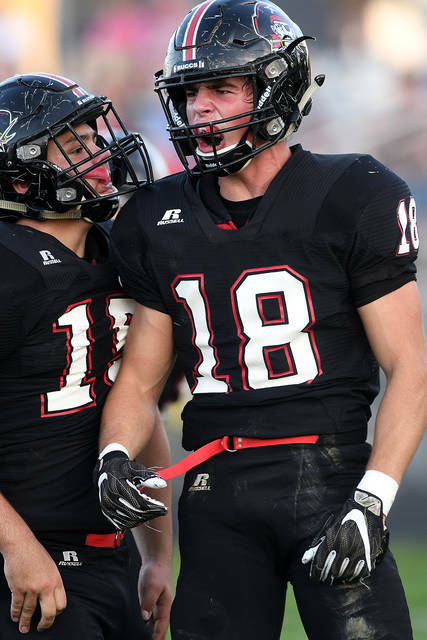 A sack by Parker Dysinger moved the ball back to the one and on the next play junior linebacker Brayden Wiggins and Gavin McReynolds stuffed Panther runner Sage Gunder in the end zone for a safety and a 2-0 Buccaneer lead. The defensive heroics lifted the Buccaneer offense, who received a short field after the free kick by Tri-County North. A nice return Wiggins moved the ball to the Panther thirty and a nice run by Dalton Weer set up a one-yard plunge by Gage Kerrigan to push the Covington lead to 9-0 with 5:25 left in the opening quarter. The Covington defense continued its dominance on the ensuing possession as another Parker Dysinger sack forced Tri-County North to punt with little room to spare. The snap sailed over the Panther punter’s head and out of the back of the end zone – resulting into yet another safety and an 11-0 Buccaneer lead to close out the opening quarter. Covington then used the big play on the very first snap of the second quarter as junior quarterback Cade Schmelzer found junior wideout open down the left side of the field for a 51-yard scoring strike and an 18-0 lead with just nine seconds off the clock. It was the first of three scoring strikes for Schmelzer in the quarter as he connected with Andrew Cates from 16 yards out and then found Austin Flick wide open down the middle of the field for an 86-yard score. Sophomore Trentin Alexander also got into the act as he powered his way in from nine yards out to give Covington a 38-0 lead at the break. With the game being played under a running clock in the second half, Covington rotated its entire lineup in and out of the game in the second half. Still, it resulted in a 44-yard scoring run for backup fullback and senior Dylan Burns early in the third quarter to push the advantage to 45-0. Tri-County North, a team who didn’t quit under adverse circumstances, was rewarded for its effort in the fourth quarter with a 72-yard touchdown pass from Brian Stinson to Tristen Mayslett to make the final score 45-8 as the two-point conversion attempt was successful. For Covington, the defense put together an historic effort as it set a school record by holding Tri-County North to negative-82 yards of rushing. This broke a record that has stood for 31 years – a record of negative-64 yards set in 1987 against Bradford. In all, the Buccaneer defense held the Panthers to 80 yards of total offense, with 72 of those yards coming on one play in the fourth quarter. Offensively, the Buccs enjoyed a short field all night, but still managed 373 yards of total offense with 155 coming on the ground and 218 through the passing game. Covington improves to 1-3 overall and 1-1 in the CCC as it looks to build on its winning effort next Friday at Arcanum. 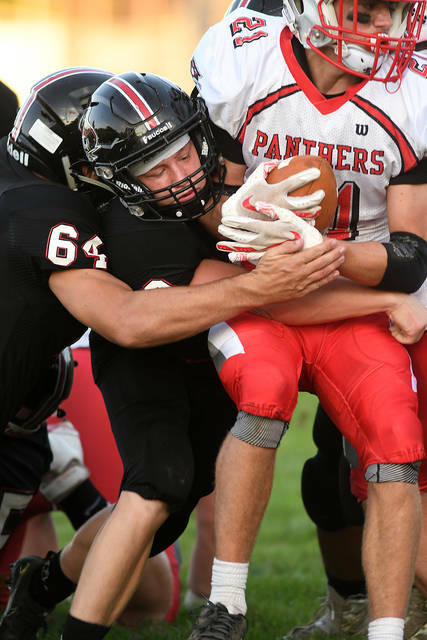 https://www.dailycall.com/wp-content/uploads/sites/30/2018/09/web1_brayden-wiggins-1.jpgBen Robinson/GoBuccs.com Brayden Wiggins (20) and Gavin McReynolds (64) make a tackle for a safety against Tri-County North Friday night. https://www.dailycall.com/wp-content/uploads/sites/30/2018/09/web1_defense.jpgBen Robinson/GoBuccs.com The Covington defense swarms to the ball. https://www.dailycall.com/wp-content/uploads/sites/30/2018/09/web1_parker-dysinger-1.jpgBen Robinson/GoBuccs.com Covington’s Parker Dysinger celebrates a sack Friday night.